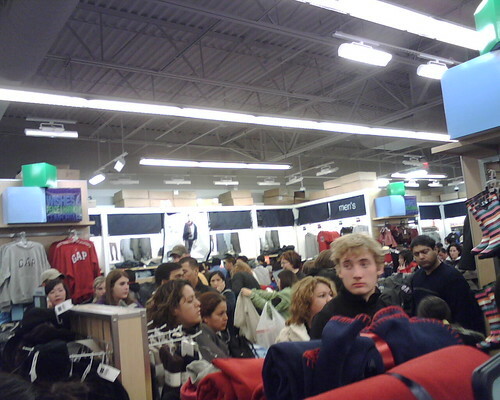 The Gap at 1:30 in the AM, originally uploaded by gotanyrice. Naomi is sick with a cold and a bit of a fever. I can't really remember the last time she's had a cold. It could have been almost a year ago. Needless to say I've forgotten just how sad she sounds when she's all stuffed up. She could probably ask for just about anything right now and I'd be tempted to say yes. Don't tell her that though. So, speaking of a year ago, here's a funny picture of her...a year ago. She looks a piece of fancy candy...or fancy curtains. I can't decide which. She keeps saying the song she wants to play goes something like this, "AYE AYE AYE AYE!" The best I can figure is it's "Crazy Train" by Ozzy Osbourne. She claims it's her Auntie Erin's favorite. I have not received confirmation as to whether that's true or not. 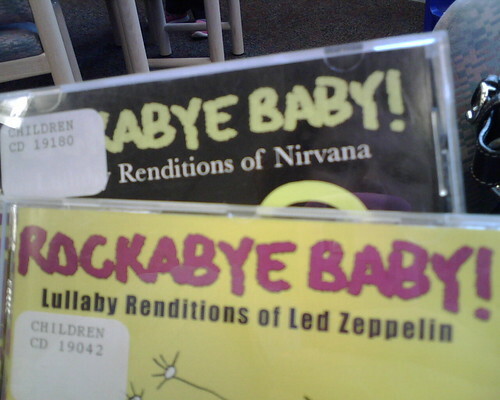 I Guess They're Never Too Young to Rock, originally uploaded by gotanyrice. The only thing that might be more irritating then having Naomi ask/beg me for every toy she sees on a commercial, is begging to buy everything she sees on an INFOMERCIAL! I kid you not. Just now she was telling me I need to buy the Sonic Scrubber (or something like that) because it will help me to clean better and it's only "something 99." A few weeks ago it was something that had green tea in it that helps your skin look better. She's just a little too attentive. His Bling, originally uploaded by gotanyrice. 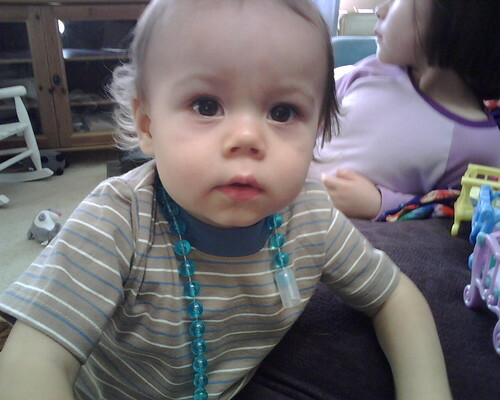 He's been playing with those beads ALL day. While driving home tonight Naomi looks out the window, up at the moon and asks, "How come the moon doesn't look like Daddy's toenail anymore?" Henry went to the SEMA car show in Las Vegas last week. Among the many MANY cars he saw I think this one is the best. It was one of the few that didn't have silicon-injected, scantily clad "women" on it. Just a guy with a weird hat, boots and what appears to be a skoal ring on his pants pocket standing in front of it. Say what you will about long hair on little girls but there's nothing like a bob sometimes right? The funny thing is that it was her idea to get it cut that short. She couldn't stop smiling when she was all done and just kept saying over and over, "I just love my new hair cut." For some reason I keep injuring my thumbs...painfully injuring them. About a month ago I sliced my left thumb whilst chopping lettuce. Then, a couple of days ago while reaching to open a door I jammed my right thumb into the door frame and managed to get a chunk of wood shoved under my nail. It is very excruciating and is simultaneously hindering my ability to button my jeans and my ability to text at the furious pace that I'm used to. Tomorrow: Rain. High 53F. Winds SSW at 10 to 20 mph. Rainfall near a half an inch. Tomorrow night: Cloudy and windy with periods of rain. Low 53F. Winds SSW at 15 to 25 mph. Chance of rain 80%. 1 to 2 inches of rain expected. And Kung Fu fighting of course! That's why we love uncles and keep them around.